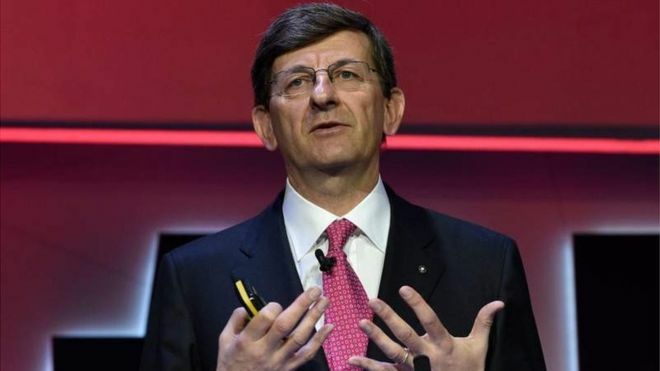 Vodafone's chief executive Vittorio Colao is to leave the mobile phone giant in October after 10 years at the helm. He will be replaced by current finance director Nick Read. The announcement came as Vodafone reported an annual profit of €2.8bn (£2.5bn), compared with a loss of €6.1bn last year when it wrote down the value of its Indian business. Mr Colao said it had been a "real privilege" to lead Vodafone. He added he would be working flat out until his departure in October, but that he had no plans after that.